This address comes with a number of caveats. I do not consider myself a Buddhist, although I have been an interested observer for some decades, and have skirted on the edges of being involved in the "three jewels" of community (sangha), the teachings (dharma), and hopefully the practise (Buddha). Personally I also have very fond memories of the pilgrimage my housemate and I took in 1996 to the Woolongong Nan Tien Temple, the largest Buddhist temple in the southern hemisphere. This pilgrimage included spending a night in a ditch on the road to Gundagai, meeting a self-identified friendly elf, a mind-reading radio engineer, and spending some time with an electronic music collective and an IT company named the "The Evil Brotherhood of Mutants, Inc" in a rather notorious Cleveland Street warehouse. Perhaps one day this very strange and wonderful journey may one day be an address in its own right. Alas, time will not permit an elaboration today. This address will not discuss the history of this non-theistic religion, nor the demographics of its estimated half a billion adherents. Nor will it delve heavily into the differences between its major schools of thought, let alone the complexity of their classification. Nor will it discuss its relationship with associated Vedic religions such as Hinduism, Sikhism, Jainism, or its historical interactions with various Chinese folk religions, Confucianism, Taoism, or Shinto. It will certainly not discuss the very human failings or successes of those associated with the religion or its institutions and the troubling phenomena of Buddhist extremism and violence. It will however, discuss some very core concepts in the Buddhist worldview, albeit in a simplified manner. These include the concepts of samsara and karma (the cycle of life, the effects of action), the situational truths of avidya (ignorance, delusion) and dukkha (suffering, anxiety)., and the procedural orientations embodied in the Noble Eightfold Path. From this, a review of some of the problems with traditional Buddhism in relation to these matters, and a reconstruction using a modern naturalistic perspective, and engagement with the problems of the world, yet at that at the same time allows for traditional faith-based approaches. In the Buddhist model, the most fundamental experience of all sentient life is that of dukkha. This can be differentiated into the suffering of experience, the anxiety arising from impermanence, and an all-pervasive discontentment in general. This realistic emphasis on suffering does have an optimistic streak. Whilst suffering is the basic feature of existence for sentient beings, Buddhism is meant to provide a path that transcends this experience. In the Alagadduupama Sutta, Gautama Buddha states: "I have taught one thing, and one thing only, dukkha and the cessation of dukkha." According to Buddhism, dukkha arises from avidya, that is suffering and discontent arises from ignorance and delusion. In a more complex elaboration this is a delusion of the world and an ignorance embodied twelve nidanas a supervenient link of karmic practises known as dependent origination. In a simpler description, it is the ignorance that the very quest for craving for and clinging to earthly satisfactions leads to intentional (cetana) actions, or karma, which itself leads to the process of rebirth known as samsara, which of course leaves a new being in another situation of dukkha. The path of ending this cycle of suffering is to follow the Noble Eightfold Path, a set of procedures that cover wisdom, ethics, and concentration. These eight factors are: Right Understanding, Right Intention, Right Speech, Right Action, Right Livelihood, Right Effort, Right Mindfulness, and Right Concentration. 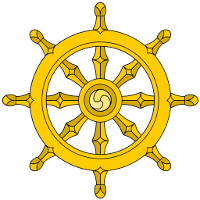 The Buddhist symbol of the dharmachakra (the wheel) represents the Noble Eightfold Path. Following this path increases the amount of good karma ultimately leading to liberation (nirvana), whereas craving and clinging produces consequences (phala "fruit" or vipaka "result") either in this life or in a subsequent rebirth. Collectively referred to as the Four Noble Truths, these provide the foundational proposition of Buddhism. To reiterated, the first Truth is that the phenomenal world provides suffering, anxiety, and discontent. The second Truth is that the this is the karmic actions based on the intentions of craving and clinging lead to the unsatisfactory cycle of rebirth. The third Truth is that ending this craving and clinging also will end the cycle of rebirth and suffering. The fourth Truth is that by following the Noble Eightfold Path, karmic actions will end dukka. There is several issues with this model of phenomena which has been debated among philosophers, Buddhist and non-Buddhist, for thousands of years, of which a few selections are illustrated here. A careful review will indicate that in principle, if not content, these issues are not dissimilar to the criticisms that can be levelled against other traditional belief systems. The first of these relates to the primacy of dissatisfaction and a solution which relies, to a large extent, in renunciation of the world as the general orientation. There is, of course, much to be condemned in the irrational grasping of possessions and power, of destructive selfish hedonism and the like. But also there is much suffering by those who become attached to excess asceticism. Buddhism's answer - to satisfy basic needs without engaging in luxury and indulgence - is nevertheless orientated to world-rejection as a whole. If the body did not have basic needs, then renunciation would dominate. But the world is also the source of sukha (happiness) as well as dukkha. The enjoyment of pleasures in calculated moderation, such as one finds in Epicurean philosophy, is more world affirming. The second issue, and perhaps as a consequent to world rejection, is the use of metaphysical speculations in Buddhist cosmology. Buddhist scriptures and commentaries include demons of temptation, two thousand kilometer high elephants, elevated supernatural devas, some thirty-one planes of existence and the planes into three realms, each corresponding to a different type of mentality, along with a cyclical notion of time, which includes past and future lives. At the same time, there are a famous set of unanswered questions that Gautama Buddha refused to answer on the grounds that they provided no use in liberation, at least in the Buddhist sense. 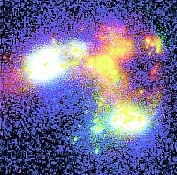 These include the age and size of the universe, which of course like other issues of cosmological questions are subject to scientific investigation, not scriptural dogma. The third issue refers to further unanswered questions, namely, the relationship of the self to the body, and life after death. This is particularly important when considering the relationship between karma and rebirth. The cycle and rebirth is not quite the same as notions of reincarnation, the migration of a deceased spirit into a new body, because in Buddhism there is no fixed sense of self in this manner, just rather a change in form. But this comes into conflict with karma as intentional action, and with right action leading to enlightenment and ultimately nirvana where the self ceases to exist. It is almost bizarre to consider that all sentient animals could have Buddha-nature, that is, a fish could consciously consider the moral justifications in following the Eightfold Path. Yet in the meantime, I still encounter good Buddhist friends who believe that they are somehow responsible - from past lives that they are unaware of - when terrible things happen to them. Obviously this will not do. Whilst a rational agnosticism is requisite for those things which are beyond the capacity of human understanding (e.g., is there an immortal soul, is there a heaven), articles of faith stated as such can co-exist without contradiction. Within the secular world however naturalism is the established epistemology in modernity because it works whereas faith-based dogmas simply do not. It is perhaps with this understanding that the Zen Buddhist Linji Yixuan made the famous proclamation some eleven hundred years ago : "If you meet the Buddha, kill him". It is a phrase of warning of becoming too attached to a doctrine and also a reminder that enlightenment must ultimately come within. It is one thing to learn from great teachers and systems of thought; it is another to be follow them in contradiction to reality. Whilst there is great benefit in an orientation that seeks to end suffering through righteous activity and mental discipline, to tie this to a transcendental notion of karma is problematic. A number of contemporary Buddhist movements have identified this and have responded accordingly. Buddhist modernism started from the Japanese Zen Buddhist D. T. Suzuki, who popularised Buddhism in the west in the early and mid twentieth century. This modernism reduced the influence of the metaphysical speculations in the cosmology, minimised ritual, ceremonies, and invocation of the bodhisattvas in practice. At around the same time, the Chinese Buddhist Taixu, also rejected the emphasis on supernatural elements, which he saw as a block to enlightenment, and coined the phrase "Buddhism for the human world", or popularly known as "Humanistic Buddhism". From the 1950s and 1960s onwards, the Vietnamese Buddhist and peace activist Thich Nhat Hanh began developing the principles what would become known as "Engaged Buddhism", where the insights of the Eightfold Path would be applied to environmental, social, and economic justice. Even more recently in the 1970s Jack Kornfield in the United States and even more recently Stephen Batchelor in the UK, have been applying "secular Buddhism", which treats canon in terms of its historical context, rejects all the metaphysical beliefs, opposes authoritarian structures of power in religious institutions, and rather encourages a practical application of the Eightfold Path as a solution to suffering that exists in this world. Thus karma, as intentional action, thus becomes a type of praxis, the application and realisation of ideas. Rather than being some sort of metaphysical residue from past lives, good or bad deeds have both a direct response in time as a result of their activities, and contribute in an aggregate form to the social environment. It all happens *within* this world, and whilst one should be *detached* from cravings, clinging, personal associations, and even harmful events, one is also *engaged* in applying principled behaviour to create a better world - to repeat *detached* and *engaged*. By way of conclusion, it must be mentioned that all world religions are confronted by similar issues and the need for transformation that is occurring in sections of Buddhism today. Christianity, Islam, Hinduism, Confucianism, Taoism, and others all find conflict between their existing canonical doctrines and traditional beliefs and an increasingly evidence-based factual and moral theories. Doubtless, given the all-encompassing theoretical framework and soteriology that religions provide, there will be fundamentalists who will oppose any such challenges, and will react violently against such encounters. Increasingly however their attachment to such impossible or speculative dogma will lose convincing force. Stripped of its supernatural claims, religion represents the higher values and aspirations of human beings. These values, both the positive (righteousness, salvation, inquiry) and negative (theocracy, damnation, dogma), represent the underlying motivations for karmic intentional action. Some people speak of karma in terms of habits or “habit energy”. Surya Das in particular draws a connection between “karmic formations” (Sankhara/Samskara) and habits, explaining that when we perform an intentional act, it leaves an impression on our mind. When we repeat it, it deepens the impression, making it easier to follow that action again. As we repeat it more, the impression becomes a groove, then a notch, then a channel, ultimately directing our lives in a certain direction. I find the idea of karma being about habit quite a useful model for looking at how Buddhist concepts relate to our daily life. Much of our life is spent on autopilot, acting in accordance with our habits and conditioning. Some of that may come from our own actions and habits we’ve developed in this lifetime, while some may come from inherited biological drives or the influence of the society we live in (which could both be described as the cumulative effects of actions over countless “previous lives”, to look at it in a naturalistic way). Some of our habitual ways of acting can be beneficial, some harmful, some not so much either way (“good”, “bad” or “neutral” karma). When we uncritically act on our habits, we deepen those habits and condition ourselves to keep repeating the same patterns over and over (the cyclic “wandering on” of Samsara, if you like). Only when we are mindful, not acting on autopilot, can we actually choose whether or not to follow our habitual inclinations or to choose another path. With a bit of wisdom, we can choose options which will be more beneficial, and that way “improve our karma” by acting in ways which develop and reinforce beneficial habits (if you associate mindfulness with concentration, this would correspond with the “threefold training” of wisdom, concentration and morality). Ultimately, if we can be mindful and “awake” all the time, then our actions won’t be dictated by conditioning and habits, good or bad, and we can act freely. This may be why a buddha is said to be “beyond merit and demerit” and not subject to karma or generating karma of any sort. It would also fit with the idea that good karma alone won’t free you from Samsara, but can put you in a better position to take the next step. As a basic model i think it sort of fits into either the “secular” view or the traditional, rebirth-oriented one.